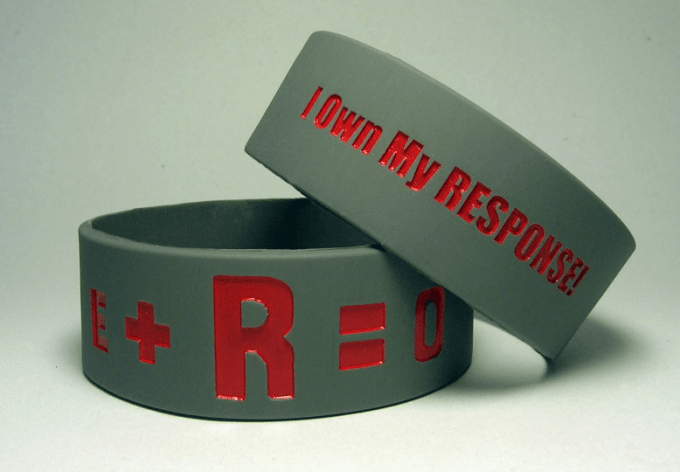 E+R=O Wristbands are our best selling resource, and for good reason! E+R=O (Events + RESPONSE = Outcome) is the #1 Live It Forward principle Kent Julian shares in all his keynote presentations and training events. And now, you and your team can use these E+R=O wristbands as a constant reminder that it’s not the events in our lives that determine our outcomes, it’s our RESPONSE! Order E+R=O Wristbands for you and your team today. Most people embrace an E=O mindset. They believe the “events” in their lives determine their “outcomes,” which means they believe success happens by chance. If someone experiences some good fortune, they end up successful. Yet, if that same person experiences challenging or negative events, then their outcomes will be negative. E=O guarantees both failure and a victim mentality. When you truly understand and apply E+R=O, you become Response-ABLE and guaranteed your success!